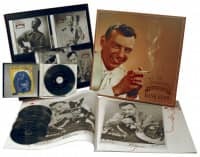 9-CD box (LP-size) with 32-page book, 219 tracks. Playing time approx. 664 mns. 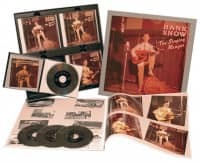 The Jimmie Rodgers Story, Cure For The Blues, Grand Ole Opry Favorites, All About Trains, Tracks And Trains, Instrumentally Yours and his rare New Zealand album, 'Now Is The Hour.' This box also includes his duets with Kelly Foxton and Willie Nelson. 05 Where Has All The Love Gone? Before 22-year-old Hank Snow auditioned at the Montreal offices of RCA Victor's Canadian Division in October 1936, Repertoire and Recording Manager A.H. 'Hugh' Joseph asked if he had any original songs. "Friends, I told him a little white lie," Snow recalled in his 1994 autobiography. "I said yes, I have two good songs that I have just written." Giving the budding recording artist the address of an old church RCA was temporarily using as a studio, Joseph told him to appear there at 2 p.m. tomorrow. Although elated by this opportunity, Snow now worried about those two non-existent originals he promised to have ready. Returning to his hotel room, he wrote a Jimmie Rodgers pastiche titled Lonesome Blue Yodel and a convoluted ballad about a cowboy singer turned outlaw. While no lyrical masterpiece, Prisoned Cowboy became an auspicious start to a recording career stretching across six decades. It also reflected Snow's lifelong fascination with the American and Canadian West – romantic places he only dreamed about during his Nova Scotia childhood. At age 12 Snow escaped an abusive stepfather's wrath by signing on as a cabin boy on a fishing schooner. For the next four years, the slight-statured youth endured grueling conditions in the North Atlantic. On his occasional visits home, he'd wind up his mother's Victrola and repeatedly play Vernon Dalhart's The Prisoner's Song and The Wreck Of The Old 97. Eventually resettling with his sister and her husband in Bluerocks, Nova Scotia, Snow bought his first guitar. Now drawn to the blue yodels of Jimmie Rodgers, he mastered the Singing Brakeman's songs and style. Prisoned Cowboy and Lonesome Blue Yodel sold enough copies to merit a second session. By now Snow concentrated on songwriting, many of his lyrics built upon sentimental Western themes. 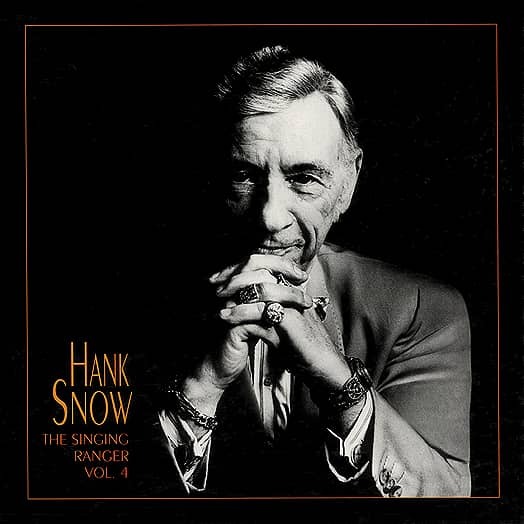 Early songs like We Met Down In The Hills Of Old Wyoming, I'll Ride Back To Lonesome Valley and There's A Picture On Pinto's Saddle hardly compared with the vivid Western sagas of Bob Nolan or Stuart Hamblen, but they helped establish a following for 'Hank, The Yodeling Ranger.' The Texas Cowboy, recorded in February 1939, was one of Snow's livelier early efforts. Its spoken introduction gives us an idea of Snow's formative broadcasts on Canadian radio. 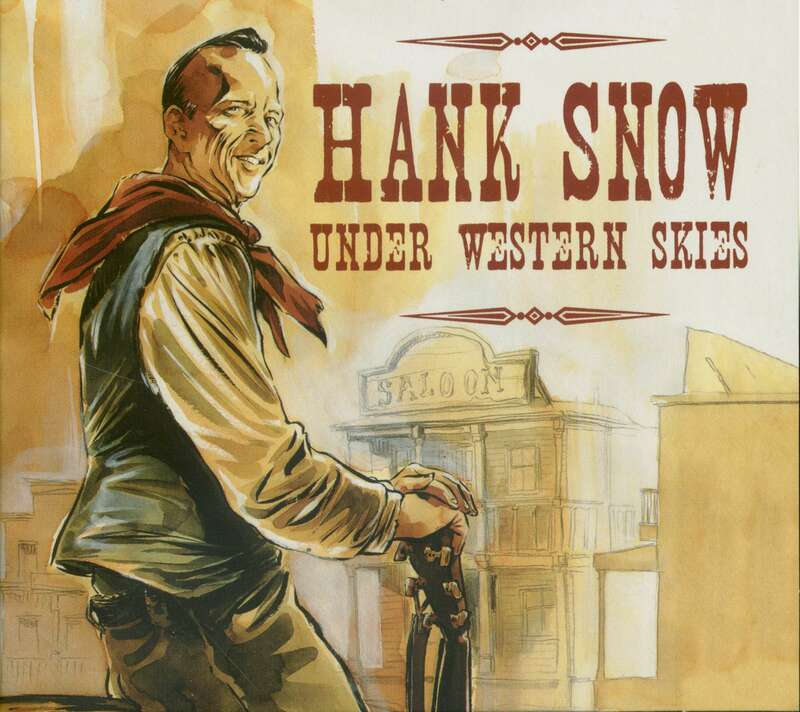 Snow's ten sessions for Canadian RCA through 1947 included at least one song about Texas or the open range. Not all were written by the singer. Snow learned Bobby Gregory's Riding Along, Singing A Song from a Decca 78 by Denver Darling. Philadelphia promoter and song publisher Jack Howard gave him Tom Grindhart's Blue Ranger. Howard, one of the first Americans to champion Snow's career, booked him into several Philadelphia-area venues during July 1944. He also brought the singer to Wheeling to meet Harry 'Big Slim' McAuliffe, who offered to help Snow land a slot on WWVA's Midnight Jamboree. Realizing his career could only go so far in Canada, Snow moved to Wheeling. As he did with many other young talents, McAuliffe worked tirelessly on Snow's behalf. Besides bringing him to WWVA, McAuliffe outfitted Snow with the essentials for a traveling stage show, including a trained horse. For the next four years Snow and his troupe zigzagged across the border. But despite his high visibility and popularity in his home country, Snow found it difficult to get any real foothold in America. Hugh Joseph lobbied RCA Victor's New York office to release his best-selling couplings in the United States. Label officials weren't interested, even though a few resourceful American country disc jockeys spun his Canadian Bluebird records to good listener response. In January 1948 the American Federation of Musicians forbade its members to make recordings. Desperate to maintain a release schedule through the year, RCA Victor turned to Snow's Canadian masters. My Sweet Texas Bluebonnet Queen was released that April, followed two months later by Brand On My Heart. Dallas disc jockey Hal Horton turned Brand On My Heart into a local hit. Its success led Snow to abandon his futile attempt to break into Hollywood; he arrived in Dallas early that fall, his trained horse in tow and only eleven dollars in his pocket. Joining KRLD's new live showcase Big-D Jamboree, Snow drew sizable crowds in clubs and concerts, but financially these proved to be lean months. Ernest Tubb, himself a Texas expatriate, convinced Snow that Nashville was the place he needed to be. RCA Victor issued three more Canadian couplings by 'Hank, The Singing Ranger' before the musician's union settled its dispute with the record companies. Though none were national hits, all sold well enough to merit Snow's first American session in March 1949. Eight songs were recorded in Chicago, and Jenny Lou Carson's Marriage Vow became a modest chart success. It gave Tubb enough leverage to bring his friend to Nashville and the Grand Ole Opry roster. Using Tubb's Texas Troubadours for his initial Opry appearances in January 1950, Snow eventually recruited a young, top-flight band, including steel player Joe Talbot and fiddler Tommy Vaden. 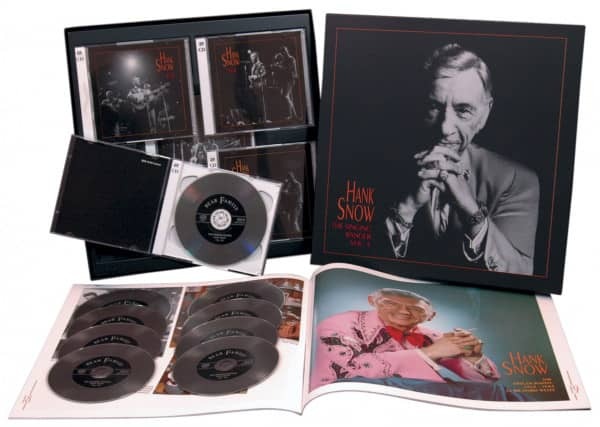 "Together they created exactly what I wanted for the Hank Snow sound,” he wrote. He brought both musicians to his next RCA Victor session on March 28, 1950. Augmented by Velma Williams on rhythm guitar and Ernie Newton on bass, they recorded four songs including a two-year-old Snow original, I'm Moving On. Released the following month, it stayed on 'Billboard's' country charts for 44 weeks, 21 of them at #1. Snow's next two singles, The Golden Rocket and The Rhumba Boogie, also had lengthy chart runs, both peaking at #1. Customer evaluation for "Singing Ranger Vol.4 (9-CD)"
His voice, simply gets better and better. Even in the 70's, the arrangements are wonderfully and authentically, "country" with twangy guitar, crying steel and twin fiddles, and that voice. Some nice " modern" touches of Merle Haggard and Kristofferson songs and the album of duets with Willie is a highlight and a treat. My tastes are all over from classical to jazz to Dylan but with the exception of Bing, okay and maybe Sinatra, there is no other voice that sends me quite so completely into that rich, transporting and all-enveloping vocal heaven. I started with one lp., picked up for a dollar and now own the complete got-to-have 'em all Bear Family collection. An absolute favorite and everybody I play them for, including people of every possible musical taste, agrees. Thank you Hank and thank you Bear Family.